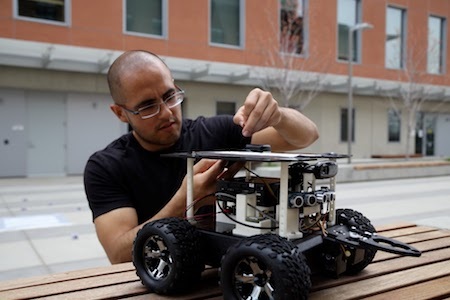 Manuel Meraz transferred to UC Merced with a mission: to revive what had once been an award-winning, student-led robotics scene on campus. 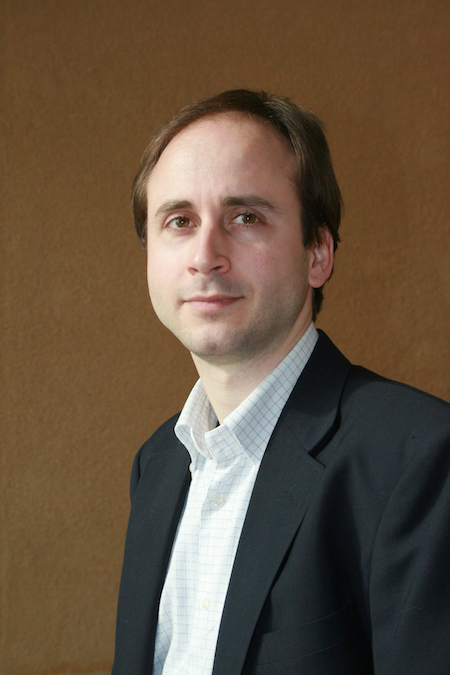 Meraz had just completed a robotics internship at the University of New Mexico, where his advisor introduced him to Stefano Carpin, professor of Electrical Engineering and Computer Science at UC Merced. Carpin, who heads Robotics at UC Merced, had a long history of mentoring students who shared his enthusiasm for robotics. His advisees even competed in international robotics competitions — they competed in RoboCup three times, taking second place in 2008 and first place in 2009. But when scheduling conflicts arose, Carpin took a break from competing. Enter Meraz, who arrived eager to resuscitate the undergraduate robotics efforts. Carpin, initially reluctant to add another obligation to his taxing schedule, was swayed by Meraz’s determination. Meraz had become familiar with NASA’s Swarmathon, a robotics competition jointly administered by NASA’s Minority University Research Program and UNM. Teams, selected from minority serving institutions, are supplied with three identical rovers (endearingly called Swarmies) equipped with identical hardware. It’s then up to each team to develop software that transforms these rovers into effective foragers. Rovers must find and gather objects of interest without the aid of real-time human guidance. And unlike the solitary rovers of NASA missions past, Swarmies must work together. “The future of robotics is not in using one super-powerful robot for all tasks, but rather to use a coalition of simpler robots collaboratively,” Carpin explained. Today’s engineers, drawing inspiration from nature, design cooperative robots to accomplish tasks impossible for individual robots. “Essentially, you can look at the swarm as a single organism with distributed sensors that are all communicating with each other,” Meraz explained. This is what NASA wants from Swarmies — cooperative rovers that mimic the efficient foraging behavior of ant swarms. 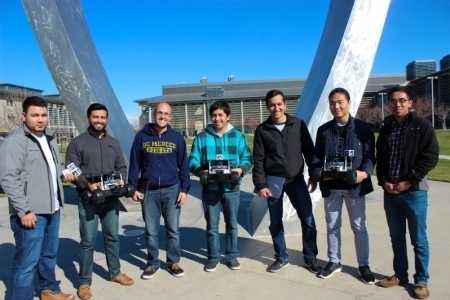 With this in mind, UC Merced’s team — comprised of Meraz, Jose Manuel Gonzalez Hermosillo, Jesus Sergio Gonzalez Castellon, Navvaran Mann, James Nho, Jesus Salcedo and Carlos Diaz — developed code to turn their trio of Swarmies into a tiny colony of robotic ants. But this was no easy task. Nor was it their only obligation. NASA also requires Swarmathon teams to engage in outreach. The team worked with students from Atwater’s Buhach Colony High School to build SumoBots. As the name suggests, SumoBots are robots designed to push each other around, the winner being the SumoBot that forces its opponent out of the ring. But for many involved, the highlight of the year was the Swarmathon itself. Six team members traveled to NASA’s Kennedy Space Center to compete. This was the first year UC Merced participated in the 2-year-old event. Pitted against 18 other teams, UC Merced came in 11th overall. However, the team did not come away empty-handed. They won second prize for their technical report describing the methods, experiments and results of their efforts. They also won third prize for their outreach report, which documented their work at Buhach Colony. Plus, Swarmathon helped two team members secure coveted summer internships. Meraz was invited to spend the summer in the lab of Melanie Moses, the UNM robotics professor who oversees Swarmathon, while Diaz and Gonzalez will stay on campus to work in Carpin’s lab on a project funded by USDA/NIFA. And Meraz and company have no plans to quit now.